Billy Gibbons has a thing for furry guitars. 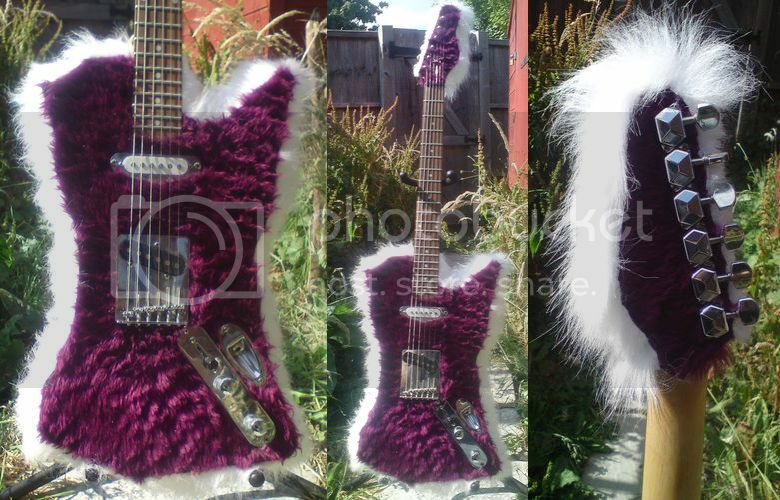 This doesn't look to be quite as accomplished as ZZ Top's furry guitars. Maybe in the mid 90's Super Furry Animals decided the animal costumes weren't enough to drive the name home and took it a bit further..... Of course Creation could only give them so much cash.... all of which could explain the instrument before us. Or... You know, it was some random 'genius'. Awesome. Do you mind if we list it on our blog (http://freeguitarlessonvideos.com)? We're starting a wacky guitar category and this would look be the first one. Will include a link to your blog. We're OK with that, could you say it came to you via Guitarz and give the link? If Jim Henson Made guitars! I like it the white fur around the outside looks great. Ce n'est pas une erreur, ce n'est pas un crime, c'est pire...C'est une faute de gout ! On par with the gruesome Veecaster posted earlier. But at least this one is funny. Thank you anyway for your very fine blog, and to show us Lefty Beauties and Oddities too. It is rare enough to note. Hi all, I actually made this! The guitar was made using 100% reclaimed materials. The neck came from a nasty-old guitar I got from a charity shop that someone had hand-painted with acrylic paint and it looked like they tried to level the frets with a belt-sander. I brought the guitar just so I could practice fret-dressing on it, it came out pretty nice (I put a lovely boiled linseed oil finish on it, made it super-smooth) so I thought I'd make a body to go with it! The body is based on nothing, I basically fed a plywood template into a bandsaw with no plan other than a centre-line. The body is actually hollow, it's an MDF core from an old table with a plywood front and back from a headboard. I was originally going to cover it in wallpaper then varnish it, however I thought it'd be funnier to cover it in fur, so I went to the local fabric shop and asked them if they had any scrap furry fabric. All the hardware was removed from guitars that I had previously modified so I just had them lying around. I rewound the pickups to be slightly hotter than average (about 7k in the neck and 9k in the bridge I think). I eventually sold it to someone, as far as I'm aware they still have it. Considering it was made more-or-less as an afterthought, I think it turned out pretty well! The action was nice and low and it cost me very little to make. I have more pictures if anyone is interested!